When its cold outside, just snuggle up and hibernate with the ones you love while you wear one of these handsome Hibernate Lodge Personalized Grandpa Shirts. 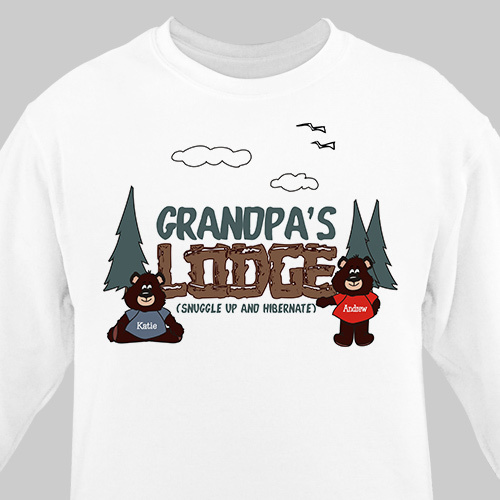 This unique Lodge Sweatshirt makes a great gift idea for Grandpa, Dad, Uncle or anyone special. Our Personalized "Hibernate Lodge" Sweatshirt is available on our premium white cotton/poly blend Personalized Sweatshirt, machine washable in adult sizes M-3XL. Includes FREE Personalization! Personalize your Sweatshirt with Any Title and Up To 30 Names. So cute, but wish 4X came in other color choices. Additional Details Looking for the perfect gift for Grandpa or Dad? We have wonderful Personalized Shirts for Him, Engraved Keepsakes, Classic Picture Frames and so much more. All Personalized Gifts for Dad and Grandpa make excellent Father's Day Gift ideas and Christmas Gift ideas.